"This ground turkey wrap recipe is one of my favorite recipes when I'm craving a burger but watching calories. Top with your favorite condiments like mustard or ketchup." Mix turkey with Worcestershire sauce and Cajun seasoning in a bowl. Cook bacon bits, jalapeno pepper, and minced garlic in a skillet over medium-high heat until bacon bits start to stick, about 4 minutes. Add the turkey mixture; cook and stir until no pink remains, about 4 minutes. Place 2 ounces of turkey mixture in each flatbread. 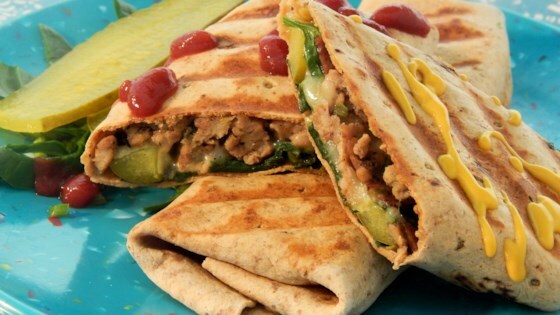 Place 4 pickle slices, 1/2 cup spinach, and 1 pepper Jack cheese slice in each wrap. These wraps may be toasted in a panini press.